It is no secret that celebrities love to vacation on superyachts but perhaps none like it quite as much as pop sensation Kylie Minogue. From days out to stretch her sea legs to lengthy holidays with yacht-owning friends, we go inside the glamorous world of Kylie Minogue's superyacht holidays... Sydney, 2016 Kylie mixed business with pleasure as she celebrated a successful show in Sydney with a cruise around the city's famous harbour in early 2016. In true pop star style, Kylie donned a metallic pink gown and posted plenty of snaps of herself dancing barefoot at dusk on the luxury yacht's aft deck. Kylie mixed business with pleasure as she celebrated a successful show in Sydney with a cruise around the city's famous harbour in early 2016. In true pop star style, Kylie donned a metallic pink gown and posted plenty of snaps of herself dancing barefoot at dusk on the luxury yacht's aft deck. 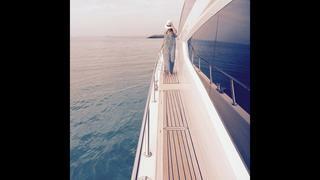 The Australian singer's most recent Mediterranean jaunt saw her spend some time on a speedy Riva in the French Riviera. Wearing a brightly patterned Dolce & Gabbana sundress and hat, this snap aptly demonstrates the allure of a chic luxury yacht charter. While in the French Riviera, Kylie took advantage of the Riva's aft deck to fit in a spot of diving. Sharing this snap with her Instagram followers, she joked, "Three pin drops and two failed pike dives later... #ImNoTomDaley". Kylie shared this pretty picture from Portofino, Italy where she was staying on board the 50.99 metre Codecasa Regina D'Italia. The pop star was a guest of the yacht's owners, fashion design duo Dolce & Gabbana, who have been friends of the singer for many years. Kylie shared this pretty picture from Portofino, Italy where she was staying on board the 50.99 metre CodecasaRegina D'Italia. The pop star was a guest of the yacht's owners, fashion design duo Dolce & Gabbana, who have been friends of the singer for many years. The three friends relaxed on the yacht after Kylie performed at the designers' Ora ball to celebrate the unveiling of their Alta Moda collection. Between enjoying the amenities of the yacht's three sundecks and 12-person accommodations, Kylie found time to show off her adventurous side by leaping into the ocean. Kylie visited Dubai in March 2015 as part of her Kiss Me Once world tour. While there she managed to take time out to perform at the Dubai World cup horse racing closing party and spend time on an impressive - but sadly anonymous - luxury yacht. When Kylie agreed to take part in the ALS Ice Bucket Challenge which took the internet by storm last summer, where else would she do it but on a superyacht? The singer was joined by friend Stefano Gabbana for the challenge as the pair were enjoying a luxury yacht vacation in Ibiza at the time. Kylie Minogue is no stranger to the Italian Riviera, having also visited the pretty coastal town of Portofino in 2013. For this trip Kylie took along her stylist friend Katerina Webb and, despite staying for the most part as guests at the on land villa belonging to Dolce & Gabbana, the women still found time for some offshore yachting fun. While perhaps not officially a vacation, Kylie certainly appeared to having plenty of fun as she attended fashion designer Roberto Cavalli's annual Cannes Film Festival yacht party in 2013. The pop star wore a lavender silk playsuit by the designer for the occasion - matching the iridescent yacht paint job on the 40.8 metre Baglietto RC. While perhaps not officially a vacation, Kylie certainly appeared to having plenty of fun as she attended fashion designer Roberto Cavalli's annual Cannes Film Festival yacht party in 2013. The pop star wore a lavender silk playsuit by the designer for the occasion - matching the iridescent yacht paint job on the 40.8 metre BagliettoRC.